This bathroom takes an industrial look and refines it. 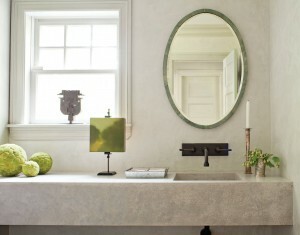 Greys and linear elements are softened by the curvature of the vessel sink and the texture of the rug. But that doesn’t mean a bathroom shouldn’t sing “sanctuary.” Western Home Journal talks to the pros about the intersection of great design and quality construction and materials in bathroom design and how the convergence of all these considerations can elevate the way we live. Whatever you call it—bathroom, restroom, lavatory, washroom, water closet, WC, or the loo—the bathrooms in our homes should be more than merely functional. At the very least, the master bathroom should be a sanctuary away from the world and powder rooms and guest baths should be welcoming. 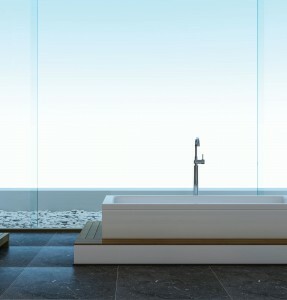 The bathroom is an intimate space and if the design is smart, function and feel will go hand in hand. 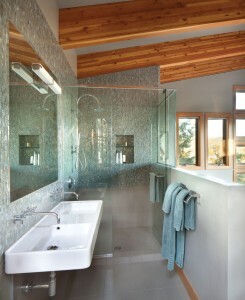 Generally, space considerations are a primary focus in bathroom design. Fitting all the essential elements into the bathroom in an efficient, space-conscious, and functional manner is important. Making space for a dual sink situation (the secret to marital bliss), a spa tub, a steam shower (if you’ve ever experienced a steam shower, you know it’s not optional), ample storage space (another key element for marital harmony), and the toilet can seem like an overwhelming task. So space considerations and the way the layout facilitates functionality naturally come first. Design professionals and architects are quick to remind us that beauty and functionality are not mutually exclusive. Part of achieving a combination of the two is a generous amount of natural light. When adding windows is not an option, layer different types of lights. And don’t forget about storage. Anyone who has ever shared a bathroom with another human being will agree—you can’t have too much storage space for all the things that you use daily but are in denial about! 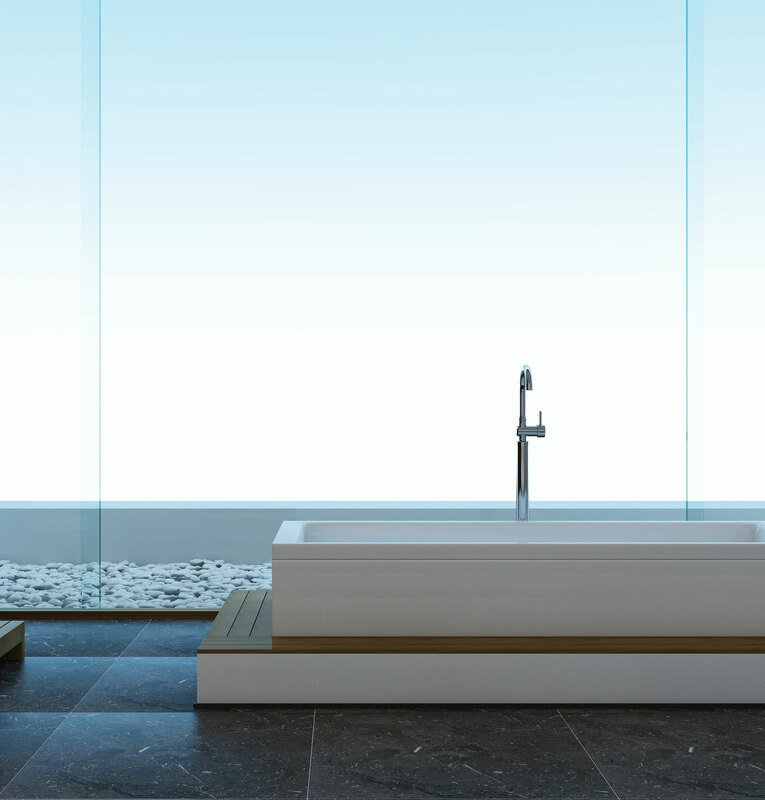 DESIGNING A BATHROOM COMES DOWN TO COMMON SENSE AND A REAL ASSESSMENT OF THE WAY THE SPACE WILL BE USED. The designers, architects, and builders we polled agree, there are no tricks when it comes to designing bathrooms—it comes down to common sense and a real assessment of the way you use the space. Examples of this common sense design? Place shower fixtures so you don’t get wet when you turn on the shower. Install a hand-held shower in the tub to rinse out your kids’ hair or clean the tub. Consider carefully the placement of hooks so they are easily accessible. And make sure you have enough storage for all of your (and your loved one’s) products. Space planning is essential, but materials also matter. 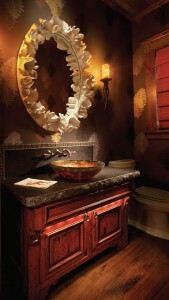 Designers agree that a variety of materials, some expected and some rather unexpected, add character to the loo. Metal has been a new muse for many designers—from corrugated siding to tiles. And the classics are classic for a reason—marble and quartzite are beautiful and versatile. 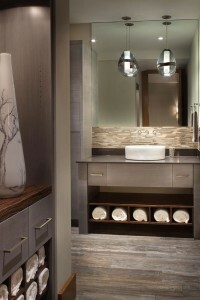 Using wood in bathrooms is tricky, but it is beautiful and many designers love the warmth of woods like walnut. And the can’t-do-without material? 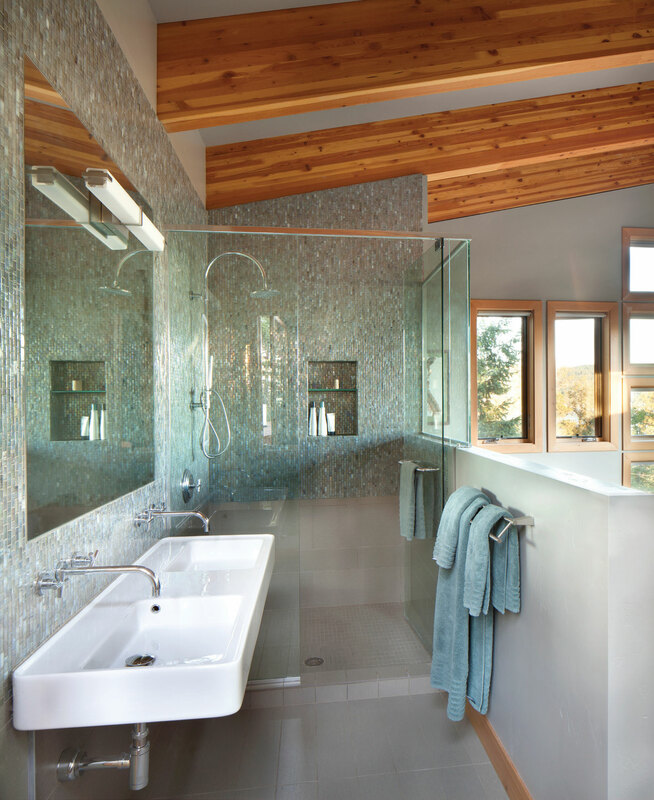 Glass in all forms, but particularly windows because natural light and ventilation improve any bathroom area. THE LARGEST AND POTENTIALLY MOST DRAMATIC COMPONENT OF A BATHROOM IS THE SHOWER AND (OR) TUB. Most of all, a bathroom should be a sanctuary. Whether you are looking for a quiet and peaceful place for a hot bath, or an elegant place to get ready for a night out, the space planning, lighting, materials, and finishes can elevate your bathroom from a purely functional space to a truly inspired space. Human nature is invariably a factor in any design project. 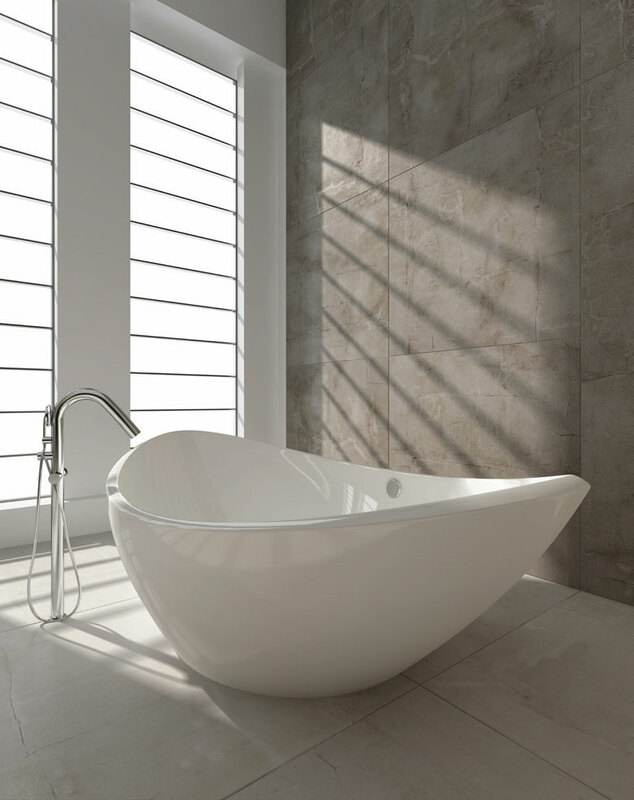 The fact is, there are endless options when it comes to tile, fixtures, paint colors, lights. Anyone taking on the task of designing a bathroom space or narrowing down likes and dislikes for someone else who is designing their bathroom space can go down the rabbit hole of HOUZZ searches, tabbing magazines, and making Pinterest boards. Certainly hiring a professional to manage how long you spend down that rabbit hole is always a good idea—in fact we live by the mantra: when in doubt, seek professional help. But still, the fact remains, the wide range of choices for all the various design elements in a bathroom can be a major time commitment. 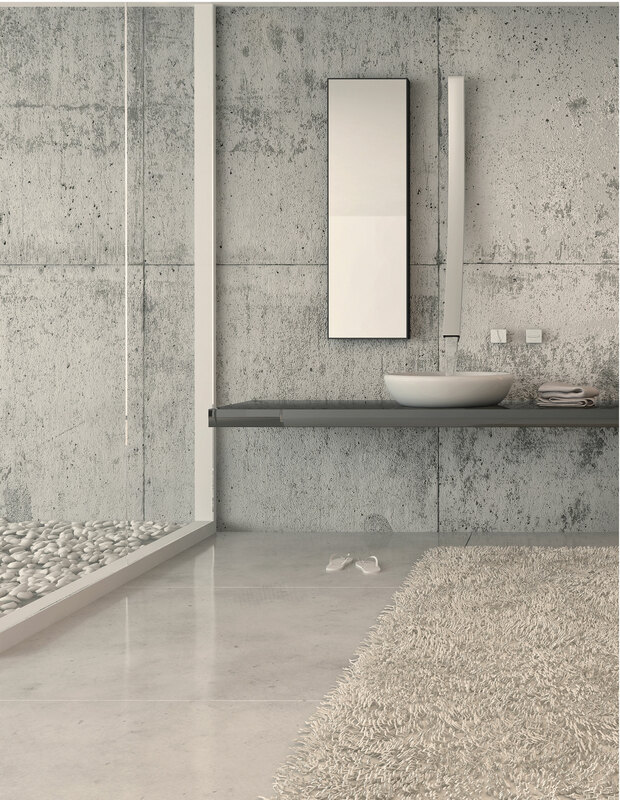 Whatever your project, whether it’s a cosmetic make-over, a complete overhaul, or a new build, you can go many directions with your bathroom spaces—a tranquil retreat or a statement piece to impress your guests. And like any good relationship, it’s always a matter of chemistry. All you need? The right space planning, the appropriate materials, and accessories that serve a function and also provide a pop. 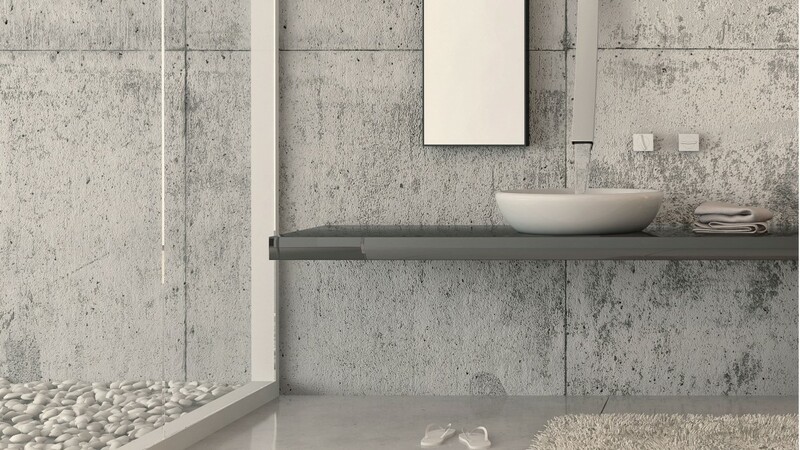 FINISHES CAN ELEVATE YOUR BATHROOM FROM A PURELY FUNCTIONAL SPACE TO A TRULY INSPIRED SPACE.